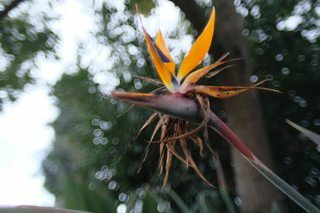 This image was taken with a Vivitar 24/2 (Kiron) prime lens. The lens is sharp. The focal plane is reasonably flat, and there is barrel distortion. The bokeh balls have an oval shape in which the long axis appear to radiate from the center, as if they were created by "zooming". What is the name of this appearance? What aberration or distortion causes it? This is just an educated guess that I've never tested or seen specifically tested with lenses that have been highly corrected for field curvature and astigmatism, which are intimately related. Most lenses highly corrected for field curvature are used for macro work or to do reproduction of flat two-dimensional documents/artwork (or to score very well on shooting flat test charts at close distances so the seller can declare they have the "sharpest lens in its class"). In such cases, the aesthetic properties of the background blur is not a primary consideration when designing the lens. Lenses with uncorrected or undercorrected field curvature often also demonstrate sagittal astigmatism. The two things combined, especially when used on a moderately wide lens with a very large aperture that results in mechanical vignetting, can produce a "swirly" type of bokeh often called the "Petzval effect." Most lenses that give such "swirly bokeh" involve a form of mechanical vignetting. The wide open aperture on the left demonstrates mechanical vignetting, when all of the entrance pupil is not visible due to the barrel of the lens blocking part of it from an area still within the lens' field of view. Even without any appreciable amount of field curvature or astigmatism, such a lens will demonstrate "cat's eye" bokeh. Add uncorrected field curvature to the equation, as well as a scene with lots of bright out of focus highlights, such as a bright sky behind foliage, and one gets the "swirly bokeh" effect. What swirly bokeh technique is this and how can I achieve it? If, on the other hand, the lens is highly corrected for field curvature to give it a more or less flat field of focus¹ and the lens also demonstrates tangential astigmatism, it seems to me the shape of the bokeh would be stretched in a radial direction from the center of the lens such as demonstrated in the example photo included in the question. By strongly correcting for field curvature, the astigmatism can shift from sagittal (as when FC is not corrected) to tangential. If sagittal MTF is higher than tangential MTF, then tangential lines will be blurrier than sagittal lines, thus spread out over a larger area in the direction perpendicular to those tangential lines. 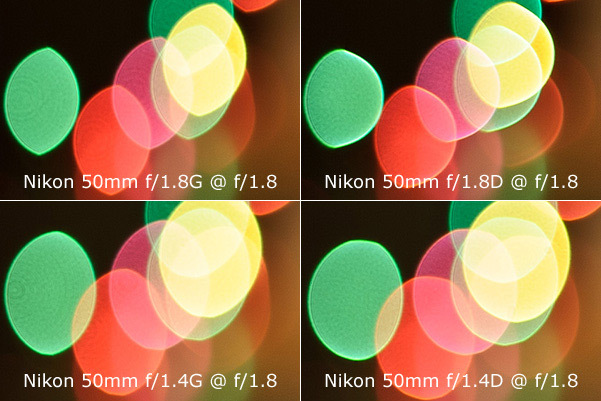 What most of us consider "good" bokeh, in terms of the quality of the out-of-focus highlights, results from lens design that leaves field curvature and/or spherical aberration undercorrected or uncorrected. That means such a lens won't be the best candidate for other types of photography, such as landscape or architecture, when we want good sharpness all the way to the edge of the frame. The classic example of this is the Canon EF 85mm f/1.2 L II. What gives it such great bokeh is the uncorrected field curvature it demonstrates. This makes it a totally inappropriate lens for doing flat reproduction work or for shooting flat test charts because the field of focus on the edges and in the corner will be a considerable distance in front of the flat subject when the center of the lens is perfectly focused on it. If you want to shoot a perfect photo of a flat test chart, the $350 EF 85mm f/1.8 absolutely cleans the floor with the $2,000 EF 85mm f/1.2 L II. But when you want that mesmerizing bokeh on the edges of a portrait there's nothing like the 85/1.2! This is a wide angle lens. A light cone causing bokeh and starting from behind the focus distance will focus on a plane before the sensor. If you now draw lines from the aperture rim through that focusing point that is seriously off-center, you get increasingly oblong light circles (also known as ellipses) on the sensor the further you move outside. Not astigmatism but Bokeh. Specular reflections emanate from highly reflective matter like dew drops on vegetation etc. Specular reflections propagate as parallel rays. This image as petite circles called circles of confusion. The name comes from the fact they often are juxtaposed and overlapped and under a microscope display a scalloped edge. Their shape, more or less, mimics the shape of the iris diaphragm. Their size is more or less based on the back-focus distance. This is the stuff of Bokeh. Now a true telephoto is far shorter than a long lens of the same focal length. This intentional shortening is produced by optically shifting the rear nodal forward. This act shortens the barrel design; thus the back-focus distance is intentionally lengthened. Now imagine you are an insect walking about on the film or digital sensor at the moment of exposure. You glance up at the lens and see an illuminated circular object. If you shift your position from center to the margins the trueness of this circular view varies. You see a perfect circle when standing on axis and an oval when standing off center. This explains your Bokeh oval pattern. It is likely not due to astigmatism. Not the answer you're looking for? Browse other questions tagged lens bokeh distortion aberration or ask your own question. 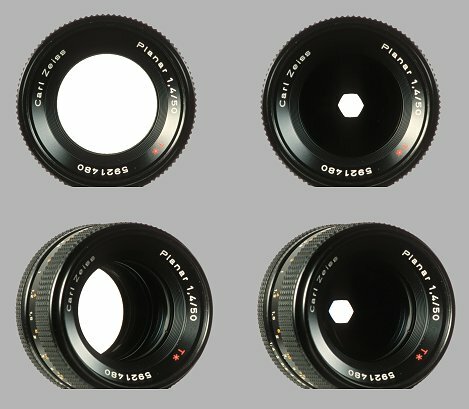 Does a 35mm prime lens show the same bokeh as a 50mm prime lens on a cropped sensor? What Micro-Four Thirds prime lenses produce pleasing bokeh? What is the cause of inclusions in my bokeh?